It's time for the New Product Launch! All the Stamps, Die-namics, and Stencils can be found HERE. Please remember to visit each of the MFT Designers' August New Product Launch posts on the MFT Blog and leave a comment by the end of the day on Thursday, October 8 for your chance to WIN one of two, $100 Gift Vouchers. Ready? Set. Comment! I have a two sets of Christmas tags to share with you today, they were created with the Gift Tag Greetings stamp set and Tag Builder 4 Blueprints Die-namics. For this first set of tags, I paired the Gift Tag Greetings stamp set with the Snowflake Flurry stamp set. The images and sentiments were stamped in Cornflower Premium Dye Ink on Smooth White card stock. The frame portion of the tags were die-cut in Kraft card stock. I finished off the tags with a few sequins and some simple white ribbon. This second set of tags are sweet little shaker tags. I die-cut the tags in Poppy, Gumdrop Green, and Smooth White card stock. The sentiments from the Gift Tag Greetings stamp set were stamped in Black Licorice Hybrid ink. The fun little presents are from the Trim the Tree stamp set. Thank you so much for joining me all week. I hope we have inspired you to create something fun, fabulous, and festive! Be sure to check out the MFT Blog to see all the fantastic creations the design team has created to share with you. Don't forget to comment for your chance to win a gift voucher. Super fun tags, love these blueprints! Beautiful tags! Love the colors that you chose! Excellent tags!! The blue/brown ones - great color combo! I love the blue and kraft tags!!! They are beautiful and I like knowing that I can use other colors for Christmas besides red and green! Gorgeous tags, the blue and kraft just POPS, and I love the cute shakers!! Wow, that blue really pops off of that kraft cardstock! Lovely! Pretty cards and love that blue!!! The blue and white tags are so gorgeous! i just love your tags! Great tags! Love all of them! Fun tags...love that Cornflower Blue color...yummy!!! 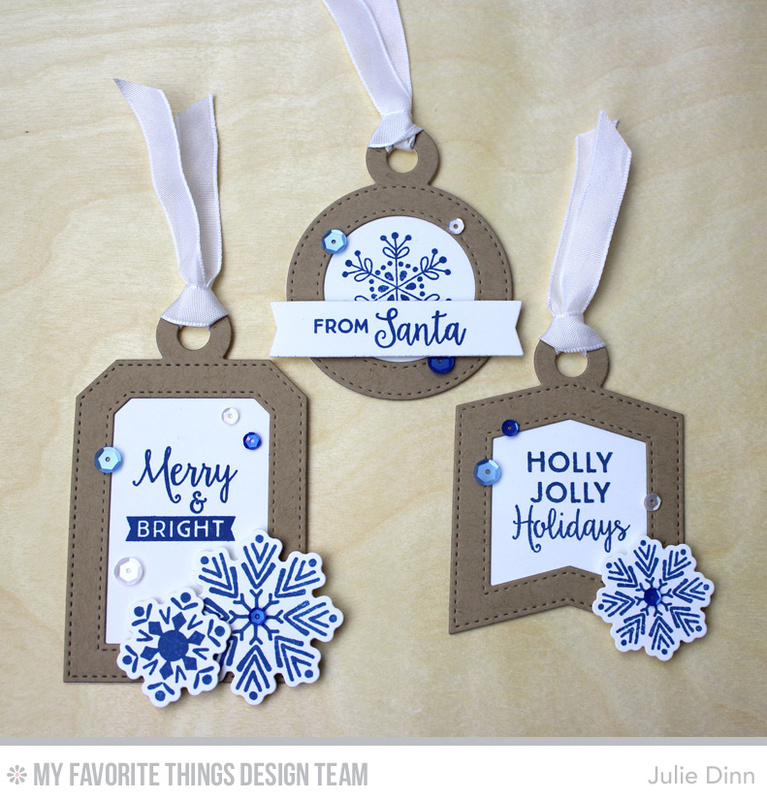 Love these festive tags! Absolutely beautiful! Couldn't resist the tags builder or the matching set that went with them! Yours are bright and beautiful! Love the Shaker ones! Loving all the tags especially the shaker ones!!! What awesome tags. A great way to give a gift. I need to add the Tag Builder to my order after seeing your fun tags. The shaker tags are awesome! I love ALL of your tags, and those snowflakes are just beautiful! OMGosh... those shaker tags are AWESOME!!!!! So fun!! What a gorgeous collection of tags and I can't wait to get my hands on those dies! Fantastic tags. Love them. The kraft and blue ones are my favorite. These are fabulous tags - these dies were one of my favorite things this release! Fantastic tags. I especially love the blue and kraft - just a gorgeous colour combo. I knew the Tag Builder Blueprint dies were fantastic as soon as I saw them... Love what you did with them, full of clever details! Love all your sweet little tags!! Super cute tags! I love the new release - so many lovely things from which to choose!! I like the tag blueprints, but really love the things you have done with them! the random sequins....over the top perfection! Super sweet tags.Amazing idea with shaker material. Thanks for the inspiration. beautiful tags! my favorites the krafts tags! Those tags are gorgeous! Love those dies! Both sets are SO pretty, but that kraft/blue is absolutely peeeerfect! Love the tags. I'm in a kraft mode and can see these adorning my holiday packages! Love the colours used in the tags! The colours are so vibrant and crisp! Bring on the holidays! What a great idea to make shaker tags for presents and keep the little ones busy instead of trying to peek in the package. I just love these stamp sets. Snowflake flurry is awesome! Great tags. Great multiple use of same products! How lovely! I thought I had my Shopping List complete until I saw these tags. Will have to add this set now to my Wish List. Love these tags. I am glad I ordered tha set, can't wait to get it. Thanks for the inspiration. Wow! Amazing tags! Those shaker ones are just awesome!! Oh, that cornflower blue is so pretty! Your fab tags show it off perfectly! Such pretty tags! I love the shaker ones! Beautiful!!! I really need these tags! I love your tags! So nice! Those shaker tags...brilliant! Love them! Julie your gift tags are absolutely gorgeous! I love the blue/white/kraft combination, very striking. Your shaker gift tags are just stunning. Thank you for all the amazing projects this week! I could practice my shaker making on something small and then work up to a big card. OMG! Your shaker tags are so cute! Love them! Beautiful tags; the shaker tags are adorable. Love all of your fabulous tags! The snowflakes are so pretty and the shaker designs are adorable! Adorable tags! And whether the sequins are on the inside or outside, I love them all! Gorgeous snowflakes! I want to make a shaker tag! WOW those tags are amazing and gorgeous! I love them all! That tag builder die set is fantastic set! I love making tags for the holidays. Your samples are gorgeous. Completely smitten with your lovely tags! Fabulous! Super fun tags - especially the shaker ones. Great inspiration and a fabulous new release from MFT. Oh my, these color combos are fabulous!!! Your shaker tags are fabulous! Nice tags ! Even shaker cards, so cute. sweet little shaker tags ! Love the tags! Love the snowflakes! Love all these tags, gorgeous!! The shapes on these tags are so fun!! And I LOVE what you've done with them. Specially love the blue with the snowflakes. These are beautiful, Jules! I love your new profile pic! You are quite gorgeous, my dear! Your tags are fabulous! I especially love the shaker tags. I need to give that a try. What fun tags! I love the kraft and blue combo the best! Very fun tags. They are so happy. Super cute tags! I love the die cut snowflakes and presents that you added to them! Wonderful!! 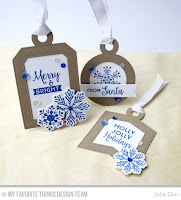 Love the blue with the Kraft paper tags! Love your tags and this new release!!!! I love the blue and kraft combo. And the shakers are so pretty! Your tags are adorable!! I didn't order the tag builders, but after seeing your post I'm ordering them now. So cute! You did a great job with the tag dies. My favorite is the shaker. love your tags , I can't wait to get this die set and make some tags too ! Amazing tags, thanks for the inspiration! Fantastic tags! Love the shaker ones especially! Beautiful tags, especially the shaker tags!! how cool!! Those Tag Builder Blueprints are so versatile! Thank you for the inspiration. awesome job on these tags, too cute, love them!! How fun are shaker tags?! What a cool idea! Julie, your tags/shakers are SO ADORABLE! These tags are totally fabulous! LOVE!